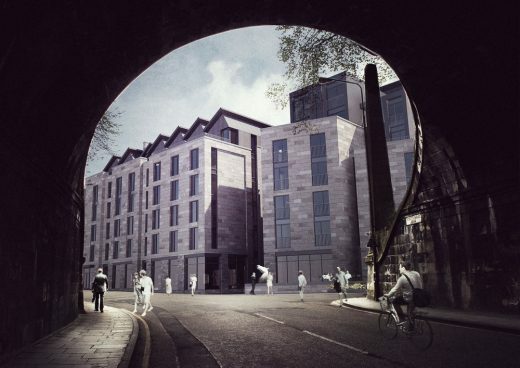 Following a review of the initial proposals submitted in December 2015, the scheme has been updated to further enhance the delivery of a coherent and authentic design that responds to the historic, current and future context of the site. 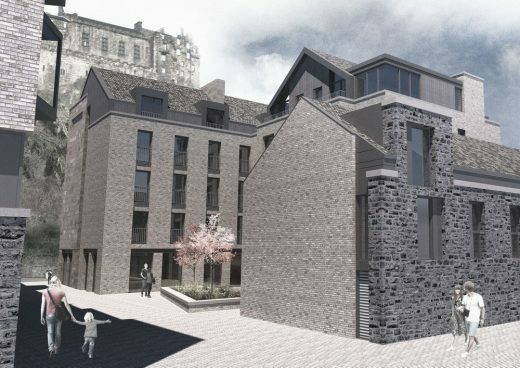 The revised scheme also responds to the consultation feedback and an ongoing dialogue with the City of Edinburgh Planning Department. 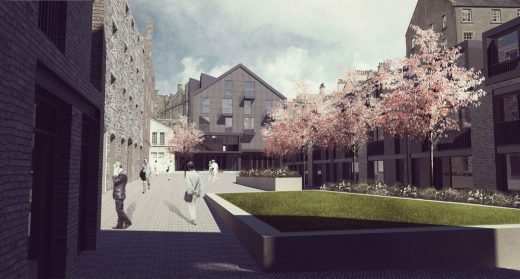 Primarily, the scheme has been updated to include a 111% increase in proposed residential accommodation provision across the site. 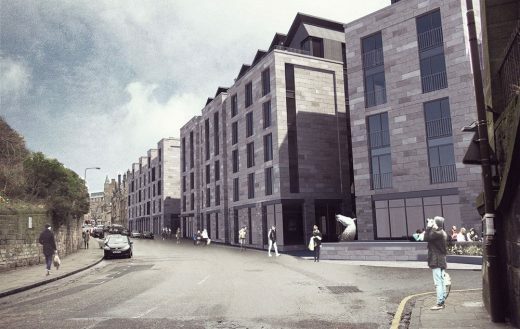 These updates combine to deliver a comprehensive mixed use scheme including 59 residential units, 650sqm Arts Facility, creation of a 92 bedroom hotel, 167 rooms of student accommodation and Class 1,2 and 3 units activating the ground floor of the development. 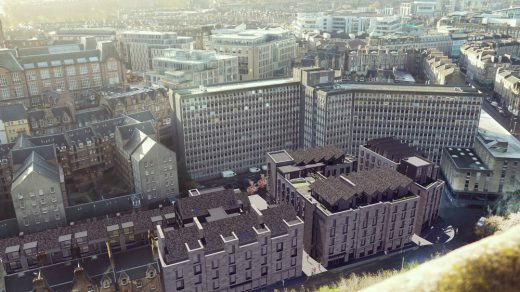 Other updates include the revisiting of the roofscape and the removal of upper floors to the Hotel, Student Accommodation and Residential blocks. 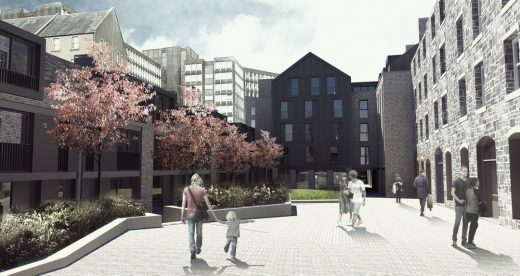 In particular, dynamic roof elements have been introduced that respond to the adjacent buildings whilst also reflecting the industrial uses that were formally on the site. These updates combine to break down the overall mass of the proposals as viewed from above or from street level. 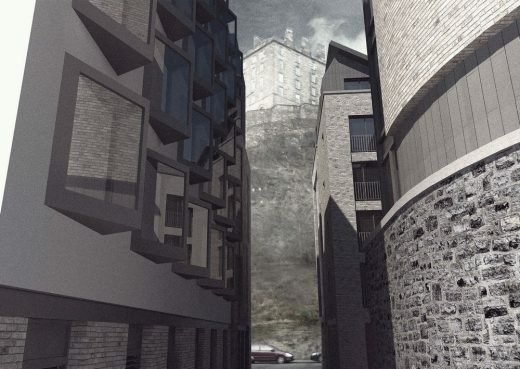 The articulated forms further integrate into the site, while also being conceptually authentic not competing or presenting a pastiche but rather, adding a further layer of variety to the range of roofscapes visible from around the site, with particular attention paid to views from the Castle, the Esplanade and Johnston Terrace. Finally, the elevations have been rationalised in order to clarify the architectural language to be deployed around this highly sensitive site with fenestration and parapets used to limit the perceived horizontality of the scheme, in particular the larger building elements. Materials have also been considered in order to achieve successful junctions between new and old buildings and, where possible, the use of traditional building techniques. Traditionally finished sandstone combines with brickwork, grey cladding and elements of render, consistent with the palette of materials found on site and on surrounding buildings. Windows have been ordered to ensure consistency around the proposals and balconies have been added to give the scheme a domestic language. Following an extended notification period, the plans will be presented to the planning committee in June.